The large, stabilized pan can hold oversized samples without tipping, and the weighted base keeps the entire scale stable. 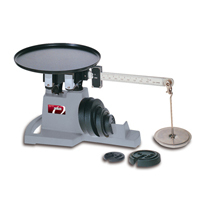 Readings up to 500 g are taken from a single, sliding-weight beam, while a set of slotted weights, stored in the base, can extend the capacity up to 36 lb. • Readings up to 1lb.